The focus and technical aim of APECS – Anaerobic Pathways to Renewable Energies and Carbon Sinks – is to integrate biochar into the production of biogas. The APECS project and its team of 8 researchers is funded by grants from the German Federal Ministry of Education and Research (BMBF) administered by the project management agency Jülich (PtJ). Ideally, the project will yield an innovative and efficient solution bringing new perspectives to farmers and supply industries. The APECS project wants to answer some specific questions about biochar: What is biochar really capable of? Can it turn digestate into more? Can it turn sandy sites into fruitful soils? And, not to be forgotten, can it turn struggling farmers into successful pioneers? Several novel reactor types are being tested. 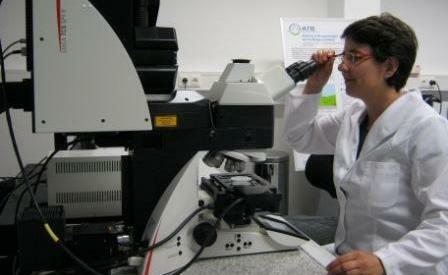 Results are characterized by a broad range of chemical and microbiological methods. Core equipment includes a 20 L pressure reactor for hydrothermal carbonization, an automated rotary kiln for pyrolysis experiments, and a novel pilot-scale high-performance biogas reactor for straw digestion. 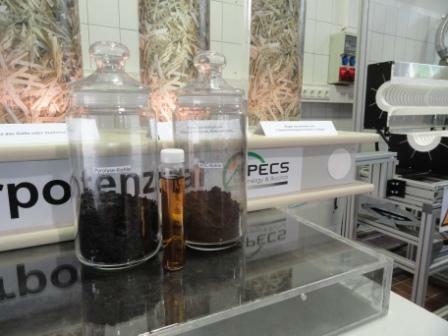 A major milestone of APECS is to develop biochar that is specifically optimized for the improvement of sandy soils. This task is connected to various questions about the target properties of biochar and how they interact with soil biota and abiota. The soil and crop effects of biochar are investigated in pot as well as field trials. There they focus on plant growth, biomass yields, and nutrient behavior. APECS considers the full-extent value chain – from field to field – and assesses the energy and mass efficiency of the process. With the aim to find potential synergies, analysis and optimization of the whole biogas-biochar system is carried out with simulation software. For this purpose they include experimental data from all areas of the project as well as from joint projects. APECS also conducts research on biochar stability and GHG emissions. Biochars are considered to sequester carbon on a long-term basis within the soil. However, carbon stability of biochars applied to the soil is expected to vary widely with biochar, soil, and climate characteristics. 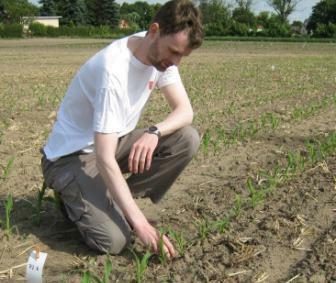 Jürgen Kern and his working group began incubation experiments in 2009 and have studied various carbon substrates – chars and soil substrates. Besides CO2, the investigation also includes the much stronger greenhouse gases CH4 and N2O. The lab scale experiments have been running now for two years. Together with his PhD students, Jürgen Kern will shortly conclude his work on GHG emissions with field experiments. These field trials will help to understand how biochar influences the CH4 and N2O emissions in more natural conditions. Together with Bruno Glaser (Martin-Luther University Halle-Wittenberg, Germany) and Claudia Kammann (Justus-Liebig-University Giessen, Germany), Jürgen Kern of ATB established a European network for biochar research, which was launched as the COST Action TD1107 “Biochar as option for sustainable management of natural resources” in March 2012. Its objective is to connect scattered European biochar research to enable quick implementation of intelligent material flow management systems, to maintain or improve soil quality while efficiently sequestering carbon in the long-term. The COST Action aims at coordinating European biochar research, bringing together researchers, stakeholders and potential users from EU and candidate countries. This will be accomplished by annual Biochar Workshops, Short-Term Missions among EU young, senior and female researchers, Training Schools, and an internet platform to monitor and streamline biochar research and innovation. Innovative biochar strategies can help the EU in mitigating greenhouse gases, while industries and farmers benefit from new markets, opportunities, and the use of improved soils, e.g. for biofuel production without endangering food supply. However, a risk assessment is necessary to protect the food web and human health. 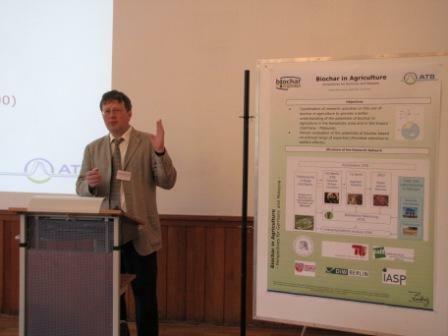 ATB coordinates the network project “Biochar in Agriculture – Perspectives for Germany and Malaysia” funded by the Leibniz-Association in the context of the Joint Initiative for Research and Innovation. The aim of this project is to analyze potential impacts of biochar use in agriculture to provide a better understanding of economic and environmental potentials of biochar. A special focus is set on the GHG mitigation potential of biochar use and its economic costs. The holistic challenge will be analyzed in a consortium led by the Leibniz-Institute for Agricultural Engineering Potsdam-Bornim e.V. (ATB) in cooperation with the Leibniz-Centre for Agricultural Landscape (Zalf), the German Institute for Economic Research (DIW), Technical University of Berlin (TU), Humboldt-University Berlin (HU) and the University of Putra Malaysia (UPM). In particular, the consortium will analyze the impact of several biochars on soil fertility in terms of yield potential, water holding capacity, nutrient dynamics and soil biology in laboratory and field experiments in the temperate zone and in the tropics (Germany and Malaysia). Some biochars are based on research from the APECS Project. The potential environmental impacts will be estimated together with cost effects at the farm level and welfare effects at the national and international levels to provide the most efficient concepts for biochar use in the tropics and the temperate zone. ATB welcomes graduate and PhD students from all parts of the world to get involved with their biochar research. In order to address the rising number of requests, they decided to organize the 1st INTERNATIONAL BIOCHAR SUMMER SCHOOL held in September 2012. Its goal is to promote biochar research worldwide and provide a valuable educational and networking opportunity for biochar investigators from all parts of the world. Twenty-two PhD students and young post-docs from USA, Germany, UK, Denmark, Belgium, Portugal, Italy, Austria, Cameroon, China and India have been selected to take part in this event. They will gather for a week and exchange results of their own research and will learn from high-ranking biochar experts from Brazil, USA and Europe. The Program will include sessions on biochar production, feedstock availability, system integration, biochar characterization, and soil effects of biochar, with practical workshops and competitions, excursion to the sites of biochar field tests and a public biochar workshop event. From left to right: Biochar from pyrolysis, liquor from hydrothermal carbonization (HTC), and biochar from HTC; all photos courtey of ATB. 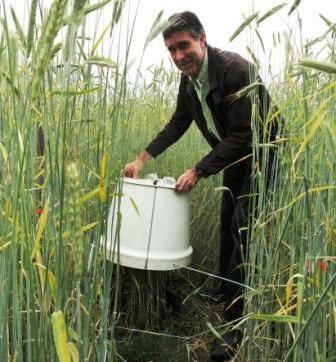 Jürgen Kern collecting samples of soil-based gases in a rye field.